This three-strand necklace features one strand of clean, faceted beads. The second strand is a pattern of the faceted beads and carved peridot beads. 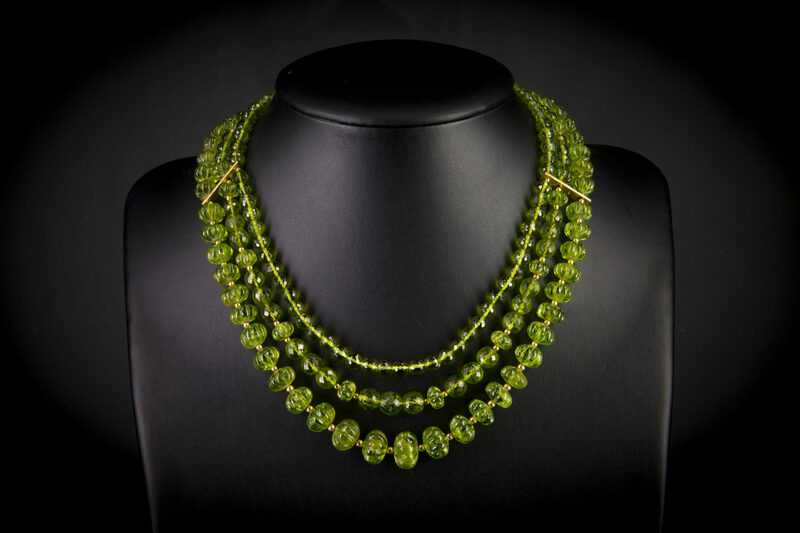 The third and largest strand is of carved melon peridot beads. Each strand is separated by pure gold beads with spacer bars of 18 carat yellow gold. The diamond and yellow gold clasp is a perfect foil for the peridot green beads. This can be worn to work, dinner, events, or even dressed down for good-casual wear. 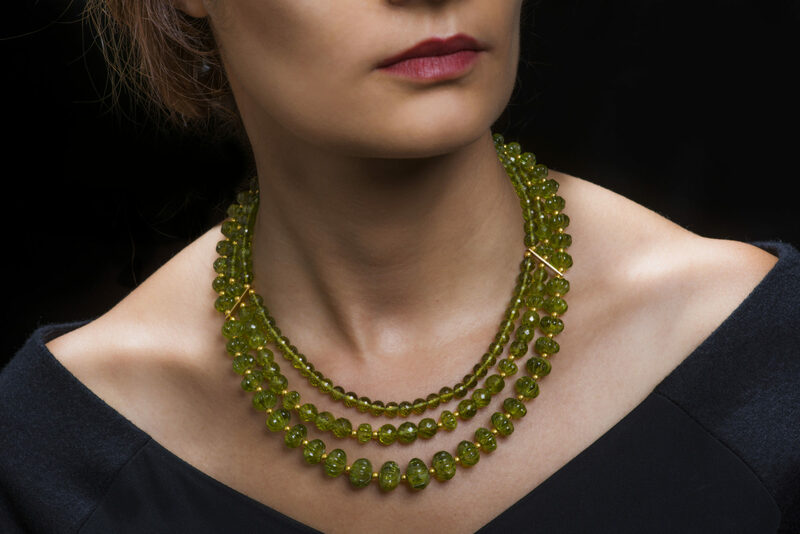 This lovely, elegant necklace was inspired by the ancient romans love for the ‘evening emerald’, the name they often gave to peridot. Unusually, its green colour did not darken at night but was still visible and lively by lamplight. Lady Jane is the English friend of the Countess – and one of her closest confidantes (as they went to boarding school together). She is a delightful and genuine woman who loves her family life. When she, her family, and the Countess return to the UK they sometimes stay awhile in their London homes (to shop and visit museums and art exhibitions) – or alternatively visit their country estates. On other occasions the Countess and (her ‘Significant Other’, a recent man in her life) and Lady Jane and her family join (with their European relatives and friends) in one of their towns, or their yachts and hotels.